The Asec dead lock provides an excellent level of insurance approved security for a very affordable price in comparison to other dead locks on the market. The sizes available for this model include 64mm and 76mm case sizes as well as 44mm and 57mm back set's. Two Keys are supplied as standard but LocksOnline does provide additional keying alike services that are performed on site by our locksmith. Rebate kits available with this model also come with a variety of finishes. Asec have been manufacturing security products in the UK for over 10 years. They have maintained a high standard of practice which is cemented by continued custom to this day. 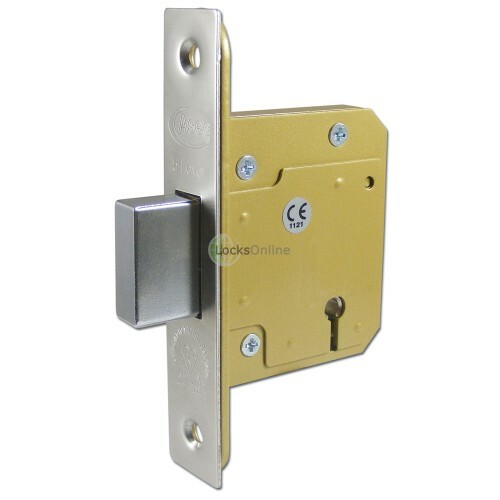 The Asec DeadLock provides excellent security for front or back wooden doors due to its 5 lever design that meets BS3621 insurance rated standards. Hi guys. My name's Darrel. I'm head of the tech team here at LocksOnline.co.uk and we're doing product reviews today. More importantly, we're doing the product review of the ASEC British standard 5 lever dead lock. Without further ado, let's actually get the dead lock up off the table here, off the bench and let's have a look at it for all of you to see. Now, it has this distinct finish as you can see here which is a goldie sort of colour but if you zoom in here, you will also see that there's a plate that sits around here. This plate is what we call in the industry is an anti-drill plate. The idea is that if somebody tried to drill this, then this plate is going to make it a lot harder for them to get in through this plate to get at the mechanism inside. If you want to zoom in a little closer there, you'll see that there's a silver piece around a key hole there as well. That's what we call a lever curtain and again, that's designed to reduce the effect of manipulation by picking the lock as well there. As standard now with all of these locks, there needs to be a 22 millimetre bolt throw. This bolt projects over 20 millimetres which again is a requisite of the British standard. It comes as standard with two keys. These are the two keys here. It comes with standard with two keys. 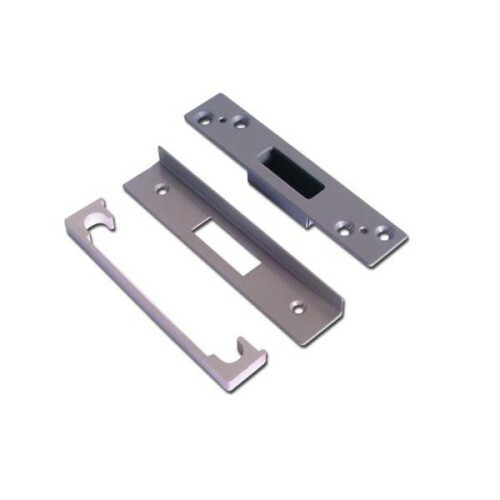 It comes with fixings as standard as well and it comes with escutcheons. You've got the one to go on the inside that this covers. It isn't blue. It's just a protective cover that's sitting over it. Then also the one outside which is here. This is the type that we're more familiar with, with the Chubb range of locks where you've got this little weather cap that sits over it there like that. That comes as standard. This particular one here is the stainless steel finish faceplate which sits on there like that. It does come in a brass finish as well should you so wish. Again, this white that you see here is the protective film over the finish. The striking, the strike plate itself is a full-bodied plate as you can see there and it's all fixed around the back as well to make it as strong as the British standards require it to be. There you go. There's not much more we can say. It's available in either the 3 inch or 2.5 inch case size. The measurement of the case is from there to there and this is the actual 2.5 inch one. What I'll do now very quickly is I'll get some measurements for you guys. If you're thinking that this is the lock for you or you want to put this in your door, with these measurements you'll see whether or not it will fit in your door. So to start with, I'll measure the case depth and of course this is the 2.5 inch version. On the 3 inch version you'll need to move all the measurements by 13 millimetres. As standard, we've got 63 millimetres case depth. The backset which is the leading edge to the centre of the keyhole there that is 45 millimetres give or take a pinch. The fore-end height, with the faceplate on, is 135 millimetres. The fore-end width here is 25 millimetres. I'll give you those fixing centres as well because that's quite important. Those fixing centres there are going to be pushing at 106 millimetres maybe 107 millimetres. The size of the bolt is 33-34 millimetres. Its thickness is just a smidgen under 11 millimetres and obviously it projects to 20 millimetres in accordance with the British standard. There you go guys. I think that's as much as I can say about this particular type of lock. If you're concerned about budgets or you need to have a British standard lock and your budget is a bit of an issue, then this is one that you may want to seriously consider. We can also key these alike for you so you can have a sash lock which is in this range as well as a dead lock if you wanted to put a lock further down on the door. 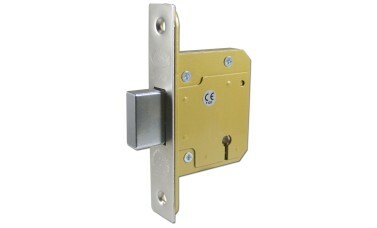 Put this with a sash lock with a handle, up a little bit further and we can key all of these alike for you. No problem at all and we can do it in-house. I very much hope that what I've explained to you today will give you enough information for you to make a considered opinion as to whether or not this lock is suitable for your application. But hey, we're on the phone. We're here. You can e-mail us. You can pick up the phone and give us a call or obviously surf our site if you're not already on it, and we'd love to hear from you. In the meantime, from me, Darrel Walters, from the tech team, appreciate your time. Thank you. Goodbye.